In 2014, Crossroads Elder Advocacy reached out to local assisted living communities, nursing home communities about an idea they had to celebrate older adults during the holidays that have no family or loved ones that visit them not only during the holidays but throughout the year. The communities were asked to provide a list of male and female residents. We received donations of new items to place in the shoe boxes and filled them with and attached holiday cards and candy canes decorated by local elementary school children. Helene Cohen owner of Crossroads Elder Advocacy and her college age daughter visited a few local assisted living and nursing home communities and distributed clear shoeboxes filled with goodies to 150 residents, and close to 100 bags of cookies and candies to another local assisted living community on Christmas Day. All the residents were so happy and pleased to receive gifts and thanked us profusely, but it wasn't until we received thank you notes from the communities remembering residents during the holidays that have no one that visits them that we recognized the true value of Shoeboxes for Seniors during the holidays and that we value our older adults and remind them that we care about our older adults in the community. When Helene from Crossroads went back to these communities to visit, she noticed that the cards and some of the gifts were proudly displayed and used on bulletin boards. As we spoke with staff and caregivers we found out that our Christmas cards and gifts were the only items residents had received throughout the year. Many residents re-read their cards regularly to help keep that memory alive. Many are excited for the holidays this year. 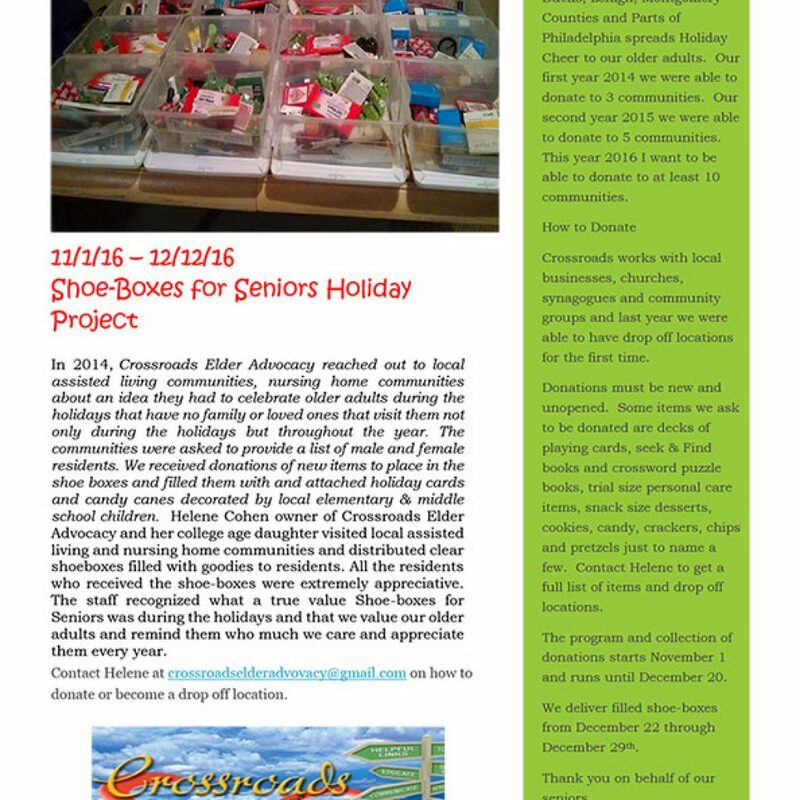 Each year Crossroads Elder Advocacy throughout Bucks, Lehigh, Montgomery, Northampton Counties and Philadelphia spread holiday cheer to lonely or financially-challenged seniors targeting seniors living in Assisted Living and Nursing Home Communities through the Shoeboxes for senior program. We hope the program will attract upwards enough collected items and donations for our volunteers to be able to deliver over 450 shoeboxes this year and that we are able to deliver to a lot more communities distributing gifts to deserving seniors. Crossroads Elder Advocacy along with LVBG reaches out to assisted living and nursing home communities to identify seniors who might not otherwise receive gifts this holiday season. Crossroads along with LVBG then works with local businesses and retail stores to help facilitate donations or purchase and distribution of gifts by placing trees with tags with items we are looking to fill the shoeboxes with within various locations. Bring items back to participating company and place in receptacle near the tree to be picked up by Crossroads Elder Advocacy. We are in need of Volunteers to help! Volunteers will help in getting items donated from local businesses, community groups to be able to fill the Shoeboxes and gifts to the seniors. Some of the items can have company logos or names that they might have used for a special event or trade show that they are getting rid of. An example of this was Lanta had an anniversary a few years back and were going to get rid of writing tablets and pencils with the date from the anniversary they donated those to Senior Shoeboxes. Dates vary by location, however, the program typically begins the 1st week of November with gift collection taking place through December 20th. Crossroads Elder Advocacy owner Helene Cohen, her daughter along with other LVBG volunteers will deliver Shoeboxes will coordinate dates with participating communities the week of the holidays throughout the area. Find a Tree today and brighten the life of a senior. 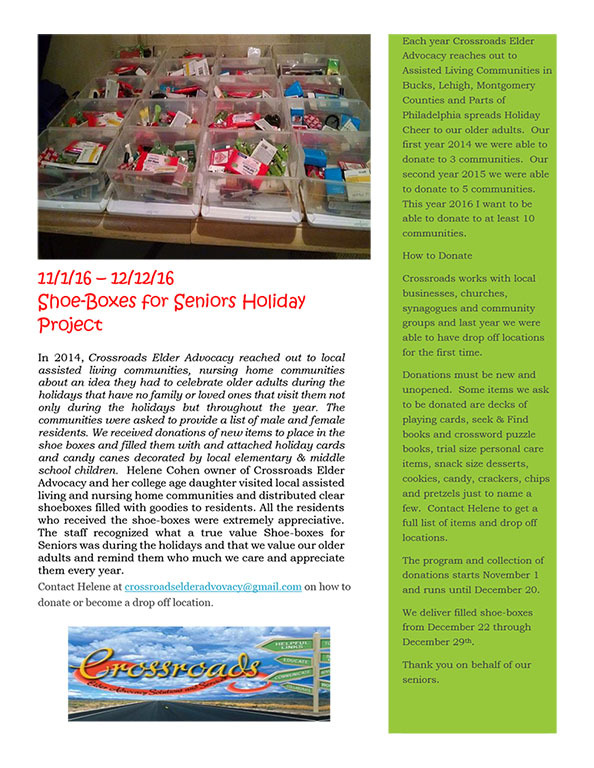 If there is no Shoebox for senior tree in your community, we encourage you to contact Crossroads Elder Advocacy to arrange for pick-up of donations helping seniors during the holidays. Donations must be new. We can’t accept used or open items.